Old Smoky Mary, it was built 1830-31. 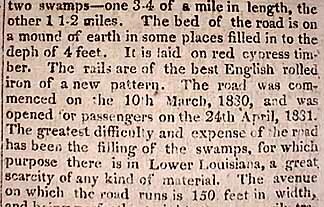 Although most transportation in antebellum Louisiana was by water, residents also traveled and traded by overland road and railroad. The Pontchartrain Railroad was the second completed in the United States. It began operation in 1831, carrying passengers and goods between the city at the Mississippi River and Lake Pontchartrain at Milneburg. States Weekly Telegraph newspaper published in Washington, DC by Duff Green. Louisiana. The paper measures 5-1/2' by 9' and contains 32 pages. 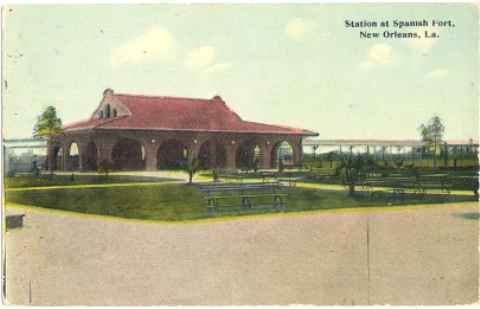 The railroad connected Lake Pontchartrain to the Vieux Carré, (along present-day Elysian Fields Avenue) and developed Milneburg Port at its terminus. While the port handled cargo from Mobile, the surrounding land soon became a resort area, initially with the Lake House tavern and Washington Hotel. Three bathhouses, other hotels and restaurants, camps, and saloons soon followed. Eventually, the name Milneburg connoted a resort area rather than an industrial port. This postcard, from about 1910, was published by C.B. with a train of the present day it was ludicrous in the extreme.